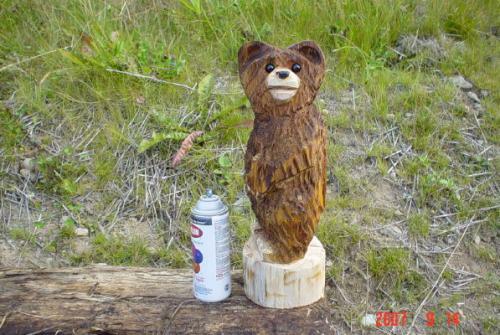 This walking bear chainsaw carving above is one of our new styles from The Dreamer's Woods. 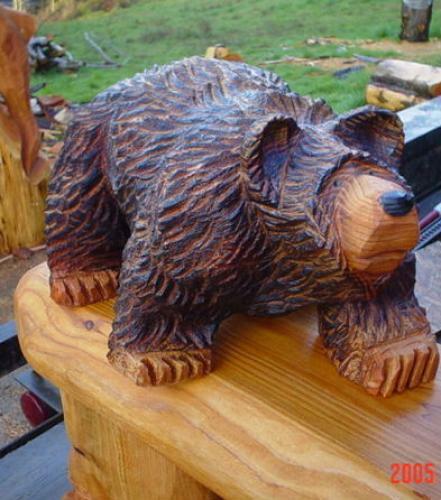 This is a baby grizzly bear that Eric carved out of Cedar. It is approximately five feet tall. 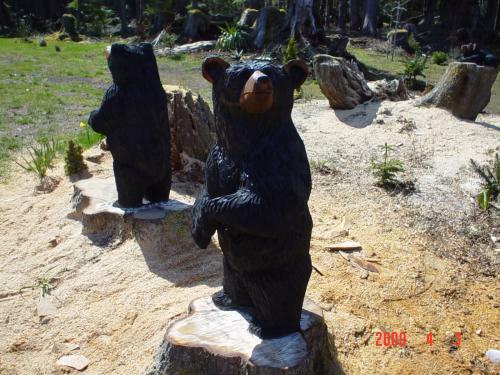 These are two black bears that Eric carved for a client out of tree stumps left on his property after a micro burst of storms downed many of his trees. 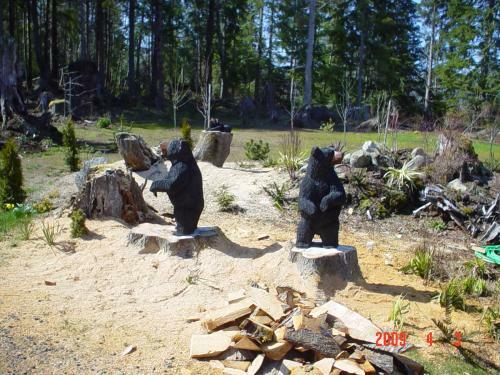 These two black stump bears Eric carved with his chainsaw are seen as one drives up to the client's home. 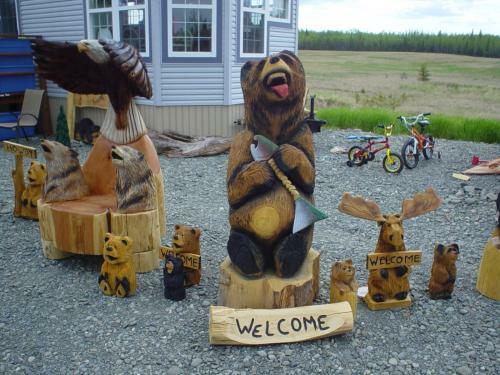 This picture features sculptures of a small family of black bears. The stumps from which the carvings are carved are from trees that a micro burst of storms blew down about three years ago. The client wanted Eric to create this adorable family of black bears frolicking in the front flower garden. Here is an example of lunch in the wild. The eagle catches the fish, but drops it and the bear claims the salmon as his own. 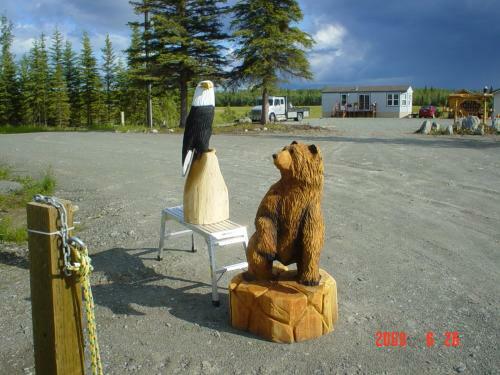 The chainsaw carved sculpture depicts the argument between the Grizzly and the eagle over who has proprietary rights over the salmon. Who will win the argument? 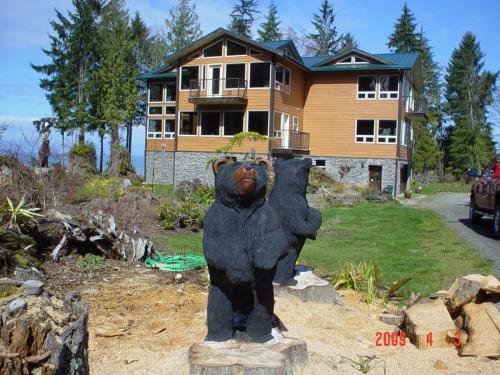 Sitting in the corner of a rustic log home, these fun little tree bears that Eric carved with his chainsaw depict the curiosity of young bears as they explore their surroundings. 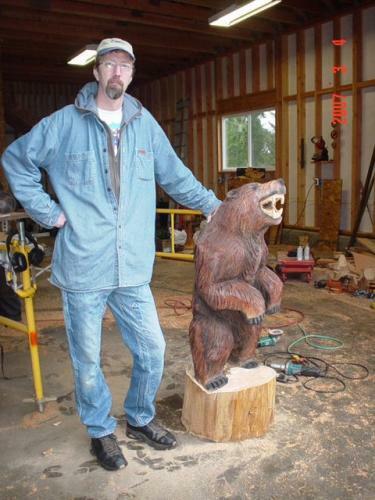 Eric enjoyed chainsaw carving this eight foot cedar growling grizzly. 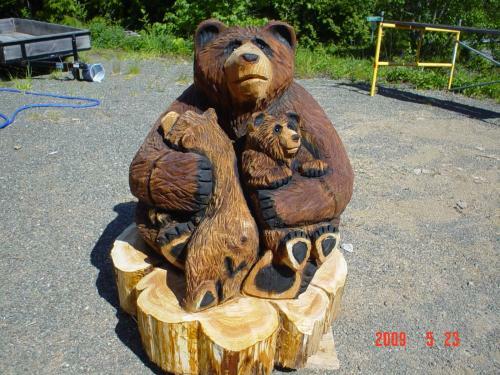 This chainsaw carved sculpture of a family of bears climbing a spruce tree was one of Eric's first large carvings. It stands approximately 12 feet tall and inspired many smaller versions of the sculpture. 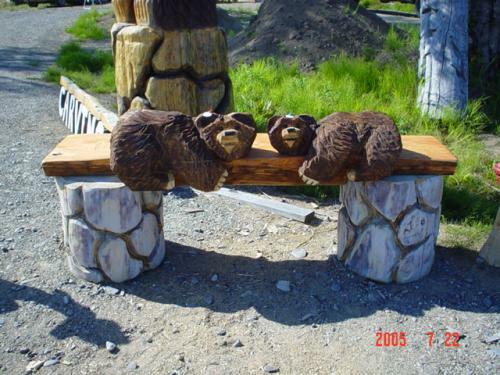 These fun little lying down chainsaw carved bears look really neat on this rock bench, but the client could also place them on porch rails or even hang them up on the side of the house to look like they are climbing up the house. The expressions of these bears are full of cheerful curiosity. 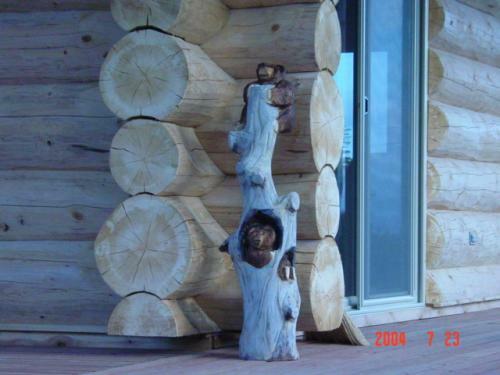 If one doesn't have much space, here is a great way to still have a chainsaw carved sculpture by Eric Berson. This cute little bear is only 2 feet tall and is quite light weight. 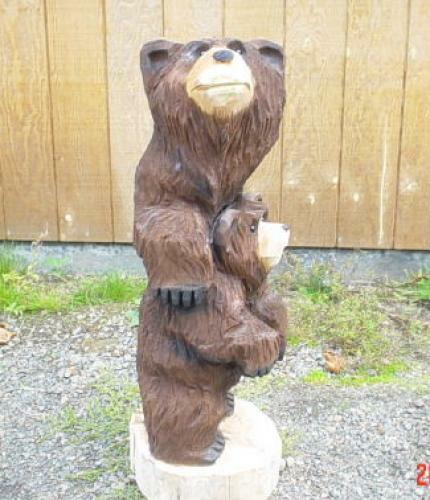 The Guardian Bear chainsaw carving was a fun sculpture to add to our bear collection. Eric wanted to depict the love and care that Momma Bear has for her cub much like moms all over the world who care for their little "cubs". It was inspired by Eric's love for his own children. One of Eric's first chainsaw carved all four's bears, this little two and a half foot bear could just walk right into the folks' laps. 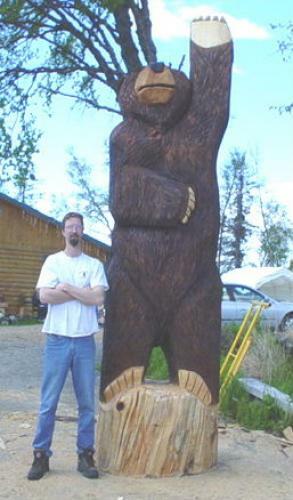 This 14 foot chainsaw carved waving bear was Eric's first massive carving. 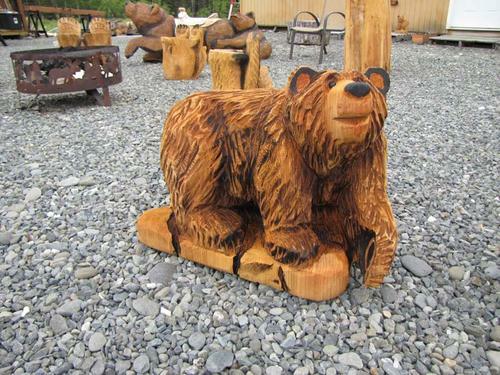 He created it for Great Bear Ford which was once located in Soldotna, AK. 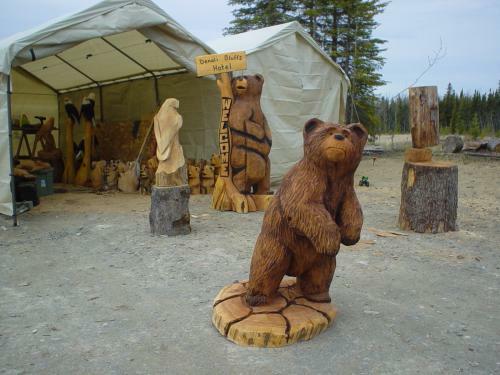 Jon Van Zyle, Alaskan artist famous for painting images of the Iditarod and other gorgeous Alaskan wildlife, commissioned Eric to sculpt with his chainsaw a very specific bear pose. 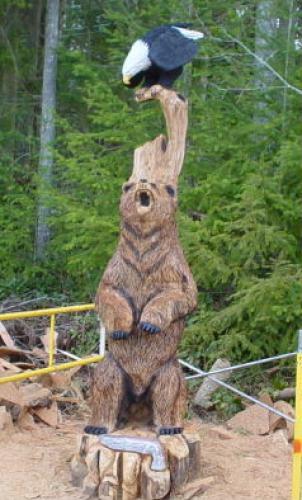 The inspiration for this cedar carving was to capture a bear just as he was beginning to rise from a crouching position to survey his world. Mr. Van Zyle was very pleased with this piece and in fact it was one of the more popular sculptures during the summer of 2009. Thank you, Jon, for commissioning such a fun piece of art. 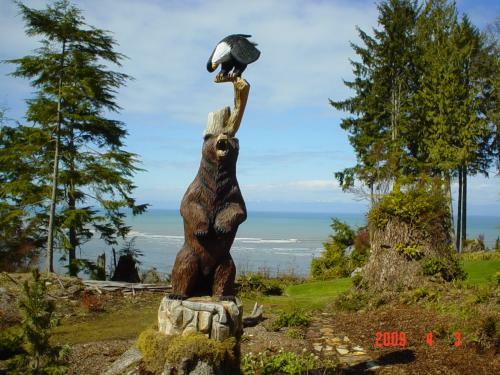 The Lunch in the Wild piece is over 12 feet tall and sits overlooking the bluff of the Straits of Juan de Fuca in the client's flower garden. 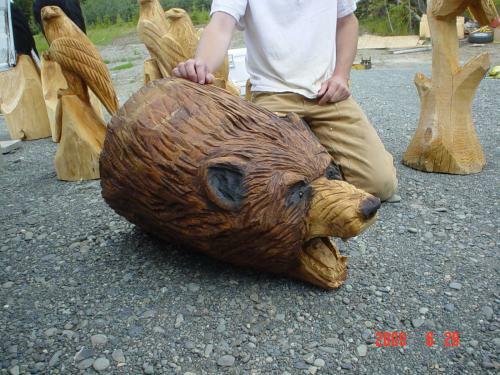 This growling grizzly head was a custom chainsaw carving made to adorn the ridgepole of a log home. 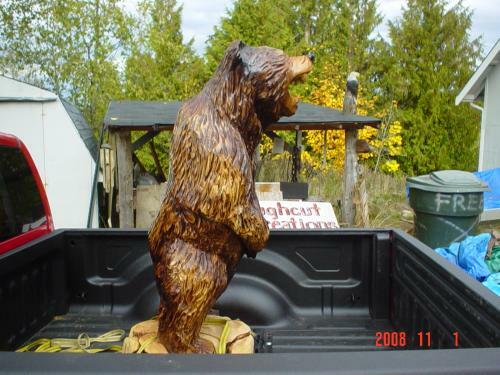 After carving this five foot growling grizzly bear, Eric had fun driving around town with the chainsaw carved bear in the back. of his truck. He sure did generate a lot of interest in his work! 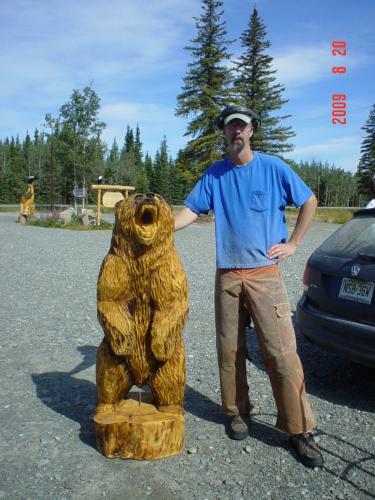 Here is a front view of Eric's chainsaw carved Alaskan spruce growling grizzly bear. Happy Bear is approximately 3 feet of chainsaw carved fun. The adorable expression on his little face made him an instant success. Eric's daughter Tia, six years old, gave her dad's sculpture her own seal of approval. Happy is light weight and easy to ship. Eric carved Mama Bear with Her Cubs for a client who wanted to illustrate the protective nature of mothers especially as one child is on the cusp of leaving the den and another remains ensconced in the protective arms of mom. 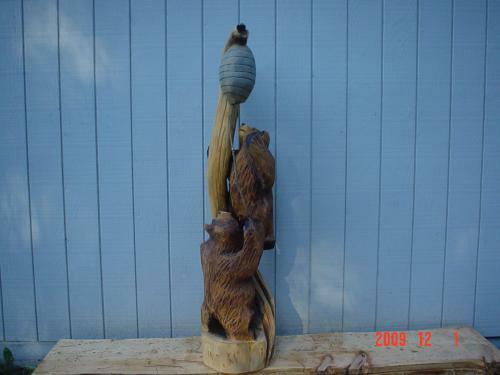 This charming wood sculpture of two bears chasing after a beehive really dresses up any corner of your house or porch. 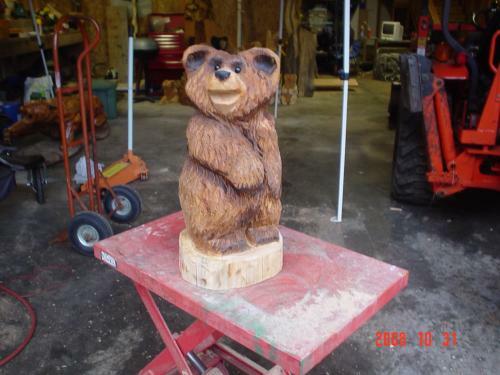 The chainsaw carving stands approximately five feet and is definitely a fun piece to show off. This six-foot bear just seems to be saying, "Got fish?" or maybe he's just had "too much mercury?" In any case, he's a fun-loving guy and would look fantastic on a porch or as decor anywhere in your yard or garden. What a great way to say "Welcome!" This charming little guy hangs about 3 feet on a wall or door and certainly adds a life of his own. Hi HO Silver! Away! Even though this might not be the Lone Ranger, he certainly is the lone ranger of the river. 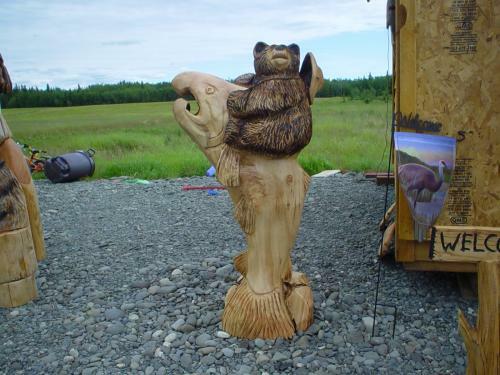 This chainsaw-carved wood sculpture captures the spirit of the bear as he does his best to tame the wild salmon to his own pleasure. 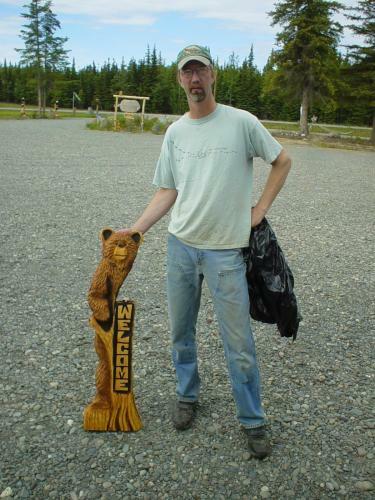 Eric really enjoyed creating this wooden artwork out of a beautiful piece of Alaskan spruce. There is so much of the beautiful grain to admire and of course, it is all carved out of one log; even the hat--no add-on's here. What a handsome fella! 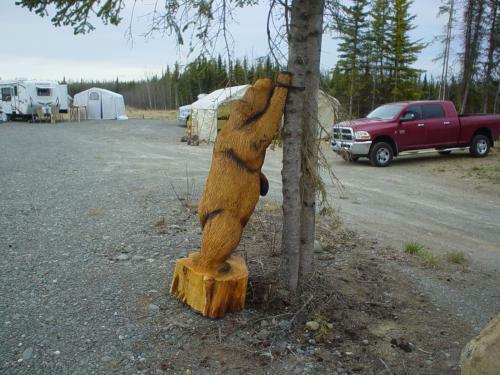 Here we have a chainsaw carving of a bear who is just standing up to take a peek at what's going on around him. Perhaps another bear is coming his way, or maybe a hiker has crossed his path; in any event, he's just a curious guy and definitely not interested in bothering anyone. The carving is about 4 1/2 feet tall. Will you please come down from there? Mama Bear was created to lean up against an archway looking up at her two cubs who have climbed up and are possibly getting into mischief. 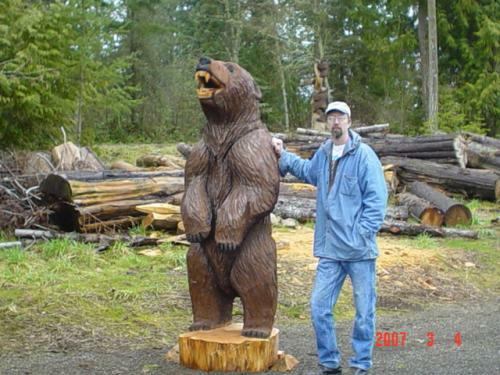 The client was thrilled with his latest chainsaw-carved acquisition.